If you really want to keep up with our HAFU news, your best bet is to join our mailing list and to also keep an eye on our FaceBook page. We're pleased to be able to announce the immediate availability of a FREE downloadable addendum for our recent book 'On The Wings of History: Volume 1'. 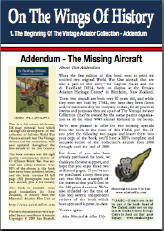 The pdf file contains two additional double page spreads showcasing two original World War One aircraft that were omitted from the first print edition of the book. All you need to do is download the pdf using the link below, print out the two pages in question, and slot them into your copy of the book, for a completely 100% accurate history of The Vintage Aviator Collection from 2000 to late 2009. Our recent experiments with Facebook have confirmed that it's a good way to stay in touch with many people all at once, and is also a great place to share information and photographs. As we've mentioned before, if you're in the 30 years plus age bracket and you're feeling a little nervous about using Facebook, don't worry -- you can still use the link above without having to create an account. Simply open the link above in your favourite browser, and then when the page has opened make a bookmark so you can easily view the page again whenever you wish. The fourth series of twelve new 1/144th scale miniatures for the Wings of War WW1 Aerial Combat game are now available. The new set comprises three each of the Royal Aircraft Factory S.E.5a, Pfalz D.III, Breguet BR 14 and Rumpler C.IV. If you enjoy the odd card or board game, then you owe it to yourself to check out this great little game. It's easy, fun, relatively quick to play, and the miniatures are just superb. This stunning new pictorial book (NZ$25) catalogues and illustrates the development and growth of the incredible collection of full size World War One-era aircraft that The Vintage Aviator Ltd has maintained, built and operated throughout the first decade of the 21st Century. 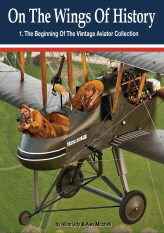 and it contains over 260 high quality contemporary photos of 47 different World War One aircraft and colour schemes. Over 90% of the photos in this book have never been published before, and the book contains 55 full page (A5) photographs, one for each aircraft, plus a few extras. Click here for details and some sample page spreads. Each card costs NZ$1.25, but of you buy them as part of the various Collectors Card Sets, you receive a discounted price. We've released our first High Definition video on YouTube - an introduction to the Quasar - a radical motorcycle design from the late 1960's! The concept of the Quasar was first mapped out in 1968 by Malcom Newell and Ken Leaman when they met up in Scotland on holiday. The design is unlike any standard motorcycle design in that the rider sits low inside the machine rather than astride it, and this design concept quickly gained the technical term Feet Forward based on the riding position. We've now released a short clip of the April 2009 public display debut of the newly restored Royal Aircraft Factory B.E.2f (A1325) owned by New Zealand based 1914-18 Heritage Trust, and restored by The Vintage Aviator Ltd.
A1325 is believed to have been one of a batch of BE.2s delivered to Norway in 1917, and is powered by a newly built reproduction RAF 1a air-cooled engine. Click here for more details about this aircraft and the restoration process. You'll also find a couple of photographs of the B.E.2f, along with the Avro 504k in our Classic Fighters gallery page (more to come later). Some of you have been asking about a DVD release of material that we shot at the successful Wings Over Wairarapa airshow (Hood Aerodrome in Masteron), back in January. We're very pleased to announce that this is now available at $17.50 including shipping within New Zealand. This 75+ minute DVD is not a full (i.e. narrated) event souvenir or documentary, but rather a highlights package only (albeit a very good one!). The disk features all the clips we've previously released via YouTube, but also includes a number of other segments not available elsewhere, including a nice short clip of the Sopwith Triplane during the practice day. The DVD is available in a PAL format only, but is presented in 16:9 widescreen format. North American users can use and watch PAl format DVD's via computer DVD-ROM drive. One of the ground theatre stars at this years Classic Fighters airshow held at Omaka Aerodrome in Blenheim over Easter weekend had to be the impressive WW2 German 88mm anti-aircraft gun. We've released a short, fun little clip of this impressive artillery piece during it's initial firing at Omaka Aerodrome prior to the airshow. The gun arrived in Blenheim unable to fire, and in fairly short order was restored to (blank) firing capabilities by a small team of Dave Lochead, Tim Babb (ex-Royal Tank Regiment), Reece Duncan, Craig Keown and Roger Lauder. Well done guys! For those interested in aircraft modelling, the recent release of a number of stunning 1/32nd scale World War One aircraft kits by Wingnut Wings has taken the modelling world by storm. 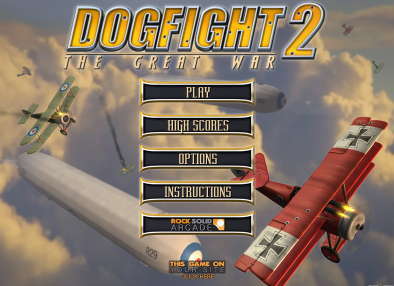 And now for something slightly different.... if the idea of playing tabletop games seems a little too '20th century' for you, and you'd rather be playing video games, then you should check out the free 'Dogfight 2' game on the internet. It's a classic arcade shooter featuring anti-aircraft fire, zeppelins, aces, bombers and bombing missions and it'll have you using up a lot of leisure time until you've completed all 24 levels of this highly addictive game. Due to popular demand, we've released two new aviation DVDs: Classic World War One Fighters and Classic World War Two Fighters. These two disks combine all the WW1 and WW2 video footage from the first four Classic Fighters Marlborough airshows (2001-2007) into a single place on their respective disks. 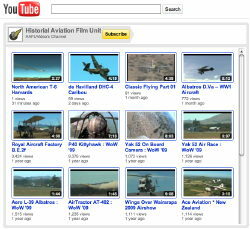 This allows those folks with a more specific interest in either/or both eras to obtain this great footage, without spending a lot of hard earned cash on the complete airshow event DVDs. Take a look at the on-line store page for more details. In recent months Alastair Marshall has done great things with Bristol Freighter ZK-CPT at Omaka Aerodrome. He has resurrected the aircraft's two Bristol Hercules engines, and has recently been able to power up the aircraft and taxi about the aerodrome -- the first time the aircraft has moved under its own power in approximately 20 years. A higher quality and larger version of this video is available on our YouTube Channel. While we at HAFU make an effort to get out and about and take photos and video footage of all manner of aircraft (and sometimes motor vehicles), we can only undertake these shoots if we know about them. If you've got a flying event planned, or if you're an aircraft owner (or pilot) who's looking for a bit more than some amateur snapshots and shaky video footage of you and your aircraft, do feel free to let us know.